Softlogic Holdings PLC has come to an agreement with Samena Ceylon Holdings Ltd. to raise private equity in order to restructure the diversified blue chip’s balance sheet and improve key capital ratios. Samena Ceylon Holdings is a fully-owned subsidiary of Samena Capital, a principal investment group focusing on the Subcontinent, Asia, Middle East and North Africa (collectively, the SAMENA region). The firm has raised more than $1.5 billion of capital since 2008 and has returned $ 615 million to investors from over 45 full and partial exits. Samena Capital currently manages total capital of approximately $ 1 billion across three primary investment strategies: private equity, direct investments, and credit. This will be Samena Capital’s first investment in Sri Lanka and its fourth investment in the Asian region within the past six months. The private placement of 182.7 million ordinary shares at Rs. 17 per share raises Rs. 3.11 billion for Softlogic Holdings PLC to be utilised to settle short-term debt. Subsequently, Samena Capital will hold 19% of the company. A further issue of 230.81 million shares by way of rights issue in the proportion of 24:100 at Rs. 17 per share will be made to raise Rs. 3.9 billion. Softlogic Holdings PLC’s present stated capital stands at Rs. 5,089 million with 779 million shares in issue. Subsequent to the private placement and rights issue, the stated capital would rise to Rs. 12,119 million with 1,192.5 million shares. Softlogic Holdings PLC has been investing in strategic CAPEX projects with a long term view. This fund-raising exercise to raise over Rs. 7 b will help the company rectify the funding mismatch and, in turn, boost profitability with noticeable saving in finance costs when equity replaces debt. This fund-raising exercise is subject to regulatory approvals and shareholder approval at a General Meeting. 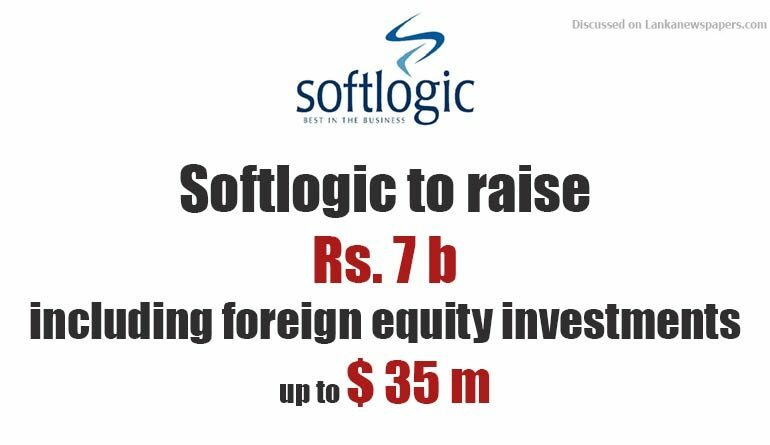 Softlogic Holdings PLC is one of Sri Lanka’s foremost, dynamic conglomerates, with leading market positions in the country’s growing economic sectors; retail, healthcare, ICT, automobiles, leisure and financial services. Softlogic holds Authorised Distributorships for key global brands and employs over 10,000 people in its offices located in Sri Lanka and Australia.